November is all about taxes — who might raise them (and screw the Party along the way, as did Doris Allen) with a little arm twisting, or someone who’s signed Grover Norquist’s ATR Tax Pledge? Troy Edgar can’t be trusted in this area (ask his City Council colleagues and his legion of non-fans in Los Al) as he simply won’t sign with ATR — the “gold standard” when it comes to keeping one’s commitments. Nor will he adequately explain why. The proof above makes it obvious — Edgar lies about taxes, he’ll raise them as he chooses — his personal pledge is proven a lie by his history in Los Alamitos. Travis Allen signed the ATR Pledge without hesitation. There’s more here Taxes, Lies. And Troy Edgar, and here where the Flash Report’s Jon Fleischman also discusses “the importance to taxpayers of being able to vote for candidates for office that are willing to pledge, in writing, that they will oppose tax increases” before Allen even entered the race. 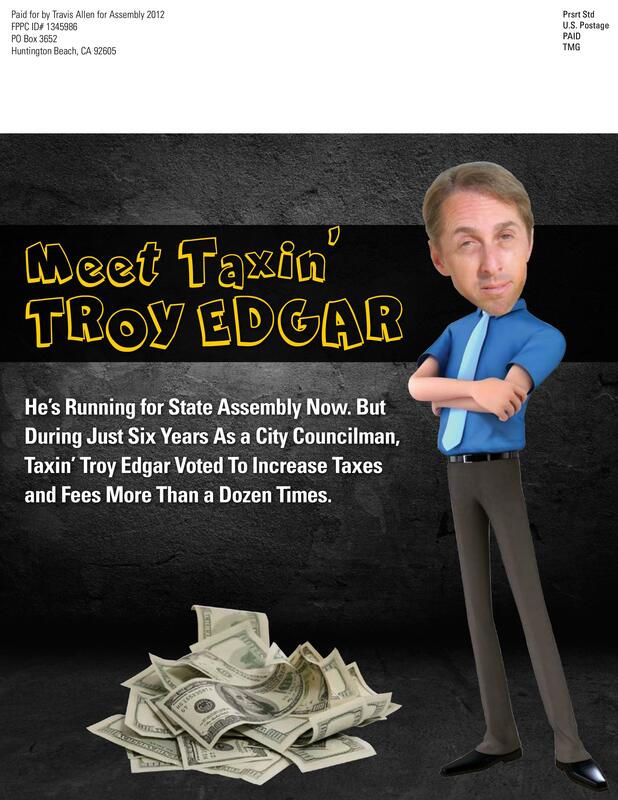 The Allen campaign won its place in the General Election with a set of very successful mailers: Travis Allen Sends Out Brutal Hit Piece On Troy Edgar, nailing the Edgar campaign with truths about its candidate and his ability to raise taxes in his small, struggling city. It’s believed that Travis Allen wants this job, in part, to “give back” and use his significant financial skills (he owns a successful wealth management firm) to concentrate on the State’s financial mess. Troy Edgar appears to need this job — it looks like he’s “all in” with his personal funding of his campaign, and NO ONE can tell if his two businesses, Global Conductor and Global Conductor Construction (web site recently taken down) are generating any revenue. As these are both private businesses, no one can determine if Edgar’s really making what he needs to support himself and his latest family, much less fund a competitive political campaign that might cost a half million dollars. Does the District need a pogue, or someone who’ll never raise taxes, and not fold the minute a Democrat approaches him with a deal? Real Conservatives like Travis Allen don’t propose multi-million dollar elevated maglev trains to run through your town. Troy Edgar’s resume includes his role a few years ago as Vice Chairman of the Orangeline Development Authority, a Joint Powers Authority which includes cities of notoriety like Cudahy, Bell, Vernon, Bell Gardens, Bellflower, Cerritos, Maywood and a handful of others that wanted to commandeer the extremely valuable Pacific Electric Right-of-Way in Orange County to run this overhead monstrosity to Irvine. Maglev only succeeds as a single transportation system in Shanghai, China, and is costing them a fortune to operate. Other implementations have failed, or worse,killed dozens in recent testing. Against Edgar’s vigorous lobbying, Los Al voted themselves out of OLDA a few years ago and denied Troy a number of trips he’d been planning for the JPA. In a transaction that would make Tony Soprano proud, Troy Edgar is accused of taking campaign contributions from Consolidated Disposal Service, a trash hauler that would later be awarded the contract for garbage collection in Los Alamitos. After a citizen’s lawsuit, Edgar’s malfeasance ended up costing the city $215k, yet he still manipulated his council majority into modifying the vendor selection process that awarded the can collecting and dumpster dumping to Consolidated. Travis Allen doesn’t hang with Trash Haulers. Today, I received another great mail piece from Travis Allen for Assembly. This is the first hit piece that I received from Travis and I have to say it is probably the best hit piece have seen this cycle. The image of Taxin Troy Edgar is definitely going to stick in my mind. I am attaching a scan of the piece to this post for people to check out. Will this mail piece be enough to make the race competitive? 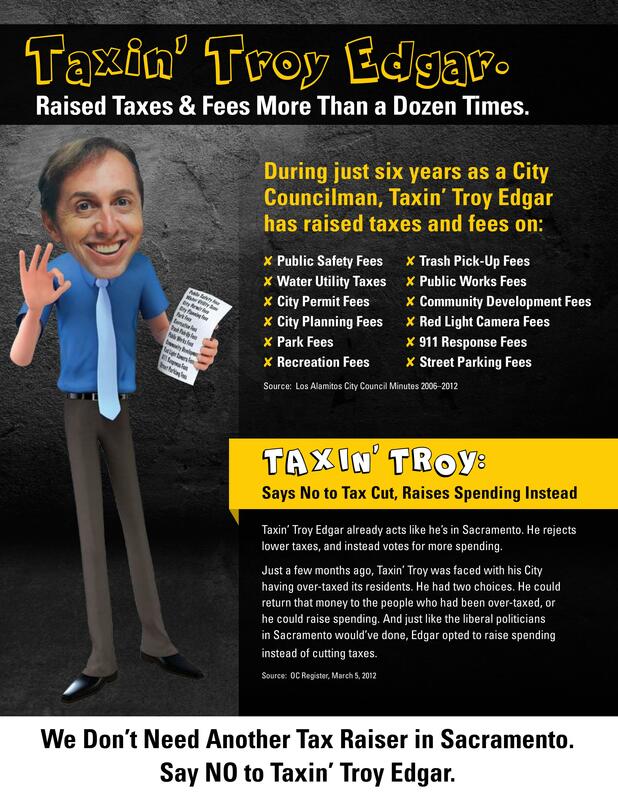 I am not sure, but I a bet a lot of voters will have a picture of Taxin Troy Edgar in their heads when they vote on Tuesday. Also, it looks like Travis has found one of Troy’s real weaknesses. Edgar’s horrible voting record on taxes and his refusal to sign the No New Tax Pledge might hunt him on Tuesday. Here is a LINK to a Press Release that OC-Breeze posted about Edgar’s refusal to sign the No New Tax Pledge.